I came across this interesting article about Michelangelo and his hidden brains. As many know, the ceiling of the Vatican’s Sistine Chapel is covered with frescoes painted by Michelangelo. The nine separate panels contain representations of nine stories within the biblical Book of Genesis, and, perhaps, images of human brains. This isn’t the first time I’ve heard theories about Michelangelo including images of the human brain in his Sistine Chapel frescoes. But usually it’s in reference to the most famous of all the panels, “Creation of Adam”. In that painting, it very much looks like God is hanging out with a bunch of angels inside a giant brain. But the new report from two American neuroscientists considers a different panel, "Separation of Light From Darkness". According to the report, this fresco contains an anatomically correct ventral depiction of the brain hidden within God’s neck and beard. The neuroscientists also see anatomical parts within the folds of God’s robe (a human spinal cord) and in the clothes around God’s waist (an optic nerve). Now why would Michelangelo hide brains, spinal cords and optic nerves in frescoes on the ceiling of a very important church? 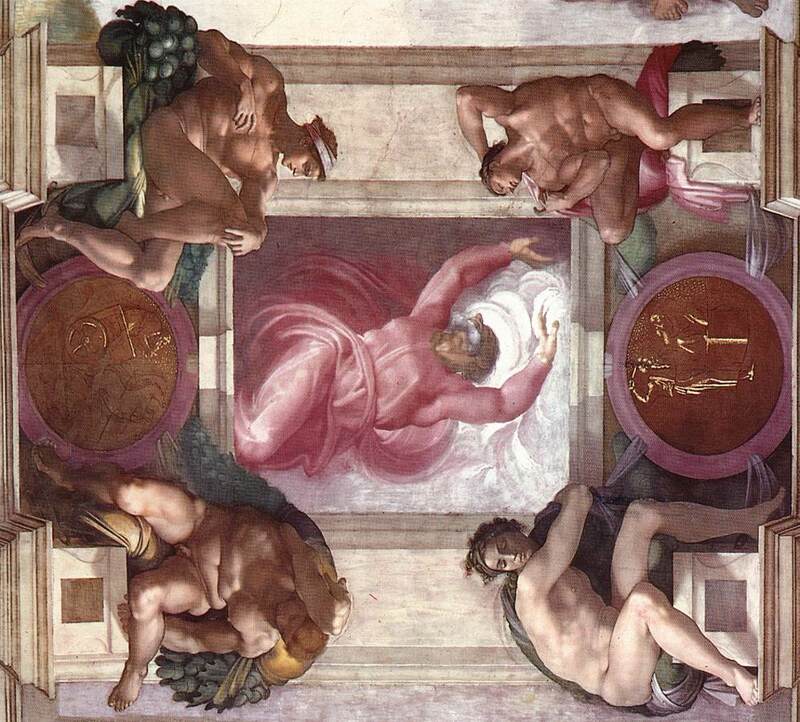 While very religious, Michelangelo also knew a great deal about human anatomy and science. So maybe he was simply showing off. Or maybe he was making a statement about God and man. Or maybe he was attacking the Church's views of science. Or maybe he was just playing games with people like us. Or maybe he didn’t paint these things at all, and we're all just seeing things where there is nothing to see, like shapes in the clouds. Personally, I choose to believe that Michelangelo did in fact paint secret brains and other anatomical objects in the Sistine Chapel frescoes. I like when artists from the Renaissance leave us coded messages.